The Evolution of Ethics constructs a conceptual bridge between biology and human behavior. This is accomplished by examining the cultural and biological feedback systems that inspire the evolution of social rules. In theory, a cybernetic process is at the heart of developing ethical systems. This process occurs when biology and culture collide. The resulting conflict acts as a form of "informational feedback," which tells people that there are serious problems that need to be resolved. Conflict inspires human adaptation in a way that could extend the survival of the species. In this sense, the evolution of ethical systems is a response to the drive of the human species to survive. Additionally, a whole array of related, "rule systems," such as statutory laws, professional codes, customs, and even the rules of etiquette evolve to advance human adaptation. Ethical systems are reasoned rules of conduct that are based on past experience, whereas moral laws (informally known) evolve over centuries of time and are often influenced and expressed by human emotions. Cybernetic ethics is a merging of science with ethics. This book presents a persuasive theory of how ethics can (and should) be linked to science and mathematics. Here, there are objective moral standards that can be derived from the consequences of human actions. The evolution of ethical systems is shown as an "adaptation." Humans adapt to survive, and they do so by creating standards and rules of behavior to stop vicious cycles of pain, suffering, and death. The more organized and efficient human activities become, the more certain the survival of the species becomes. The science of cybernetics best describes this process. Mathematician Norbert Wiener first developed cybernetic science in 1947. In an evolutionary context, cybernetics means "informational feedback in dynamic systems" (such as a social system) that sustains or redirects behaviors. Or, more properly stated; cybernetics is the study and analysis of informational feedback in dynamic systems that affect "change in the environment." When the subject of ethics arises, reasonable people often ask, "Who's to say what is right or wrong?" When ethical development is viewed as a science, it is not so much who's to say an action is morally right or wrong, but rather, "What's to say an action is right or wrong?" The "what" is defined by inherent physical and psychological limitations within personal circumstances that make it impractical or imprudent to pursue certain behaviors, attitudes, or methods of reasoning. There are reasons why ethical systems evolve. Although it is not specifically stated, this book points to the solution of a two-thousand-year-old philosophical conundrum. It is the puzzle of how one logically reconciles the coexistence of first principles of ethics and the obvious cultural and moral relativism that exists all over the world. The answer is that species and subsets within species survive and adapt better if there is are diverse ethical systems. Thus, one would not expect only one moral system to prevail in the world. The solution is derived in the context of ethics being linked to science. Morality and ethics are an extension of biology and shows itself in the evolution of ethical systems to make human existence more stable and survivable. A major theme of this book is the integration of science and ethics. Most philosophers would think this task impossible. Evolutionary ethics is in its infancy, and at its core is evolution. Evolution is facilitated by adaptation, which is, in turn, moved by systemic feedback. Feedback is a cybernetic phenomenon usually discussed in purely mathematical terms. Evolution, adaptation, and feedback are all scientific; thus one might assume that evolutionary ethics would bear some relation to science. Evolution is a dynamic phenomenon; the meta-ethical logic of philosophers is static. Morality is a dynamic phenomenon that evolves within societies, and static words fall short of describing it adequately. The first four chapters describe how systemic feedback arises in a culture. The focus here is on feedback. Not only does the book discuss feedback in an evolutionary ethics context but also in a cybernetic ethics context. In theory, cybernetic ethics is a mathematically based science that examines feedback in human systems. It bears no relationship to philosophy. Evolutionary ethics, however, does relate to philosophy. In the first four chapters, morality is seen being shaped by human pain, suffering, and death. Actions bring consequences, and pain, suffering, and death act as systemic feedback, indicating to society that something is wrong and needs to be fixed. By contrast, human beings generally seek to maximize peace, prosperity, and productivity and to avoid pain, suffering, and death. In other words, society tends to change its behaviors and attitudes when afflicted by pain, suffering, and death; this is called adaptation. Quantification of feedback is theoretically possible in cybernetic ethics. The fifth and sixth chapters introduce the idea of cybernetics and evolution. The next three chapters have been superseded by “Charting Human Behavior,” “Visceral Morality,” and “The Philosophical Implications of Cybernetic Ethics.” “Charting Human Emotions” is a theoretical piece that expands upon the idea of systemic feedback, introducing the concept of a societal memory. One can see this idea at work in the moral view of alcohol consumption. Memories of the effects of alcohol on human beings go back hundreds, if not thousands, of years, shaping the prevailing moral view of alcohol. “Visceral Morality” is an interesting chapter. Here, visceral responses are seen as indicators of moral knowledge. 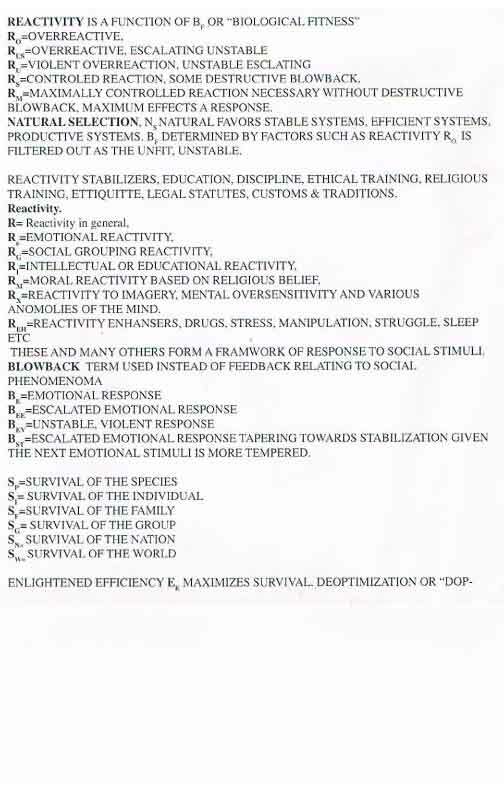 These responses are categorized in terms of reactivity. Reactivity relates to the intensity of a response to environmental stimuli. In theory, reactivity can be mathematically quantified. Five levels of emotional reactivity are cited. “The Philosophical Implications of Cybernetic Ethics” is the last chapter, which revisits systemic feedback. It is the first time the subjects of science and evolution are raised. Here, linguistic concepts find fault with the use of moral words, such as good, which meta-ethical logic deems indefinable. To the philosopher, good derives from logic, but experience says otherwise. The notion of good was preceded by the experience of it in the evolution of a language. Morality and ethics also have evolved from human experience. Philosophers have issues with the legitimacy of evolutionary ethics. They obstruct any meaningful progress on the subject with the is/ought dichotomy and the naturalistic fallacy. Here, one cannot logically move from what is to what ought to be. However, logic is not reason; they produce different results. If what is is drinking alcohol and driving, and what you ought to do is not drive, because a hundred years of traffic statistics say it’s dangerous, then you have violated the principal of the is/ought dichotomy. The static logic of the philosopher says one thing, and the dynamics of driving intoxicated say something else. There may not be much to say about cybernetic ethics at this juncture. Nevertheless, with time and some investment of energy by cybernetic mathematicians, the concept can evolve into a science. Living systems of all descriptions have evolved both cooperatively and competitively for more than a billion years. Since biological systems have been intertwined for so long, a change in one system can cause a change in many others. In theory, these changes disperse through the environment like waves generated by an object hitting the surface of a quiet pond. Biological interrelatedness extends to human social systems as well, thereby imposing limits upon what people can reasonably do. Human beings are not at liberty to do as they wish because personal actions often inspire consequent reactions and sometimes overreactions that need regulating by way of laws and morals. This regulation affects individuals as well as large groups. An example of this might be seen in the careless use of fluorocarbons that thin the ozone layer, allowing harmful radiation to reach the earth and threaten the survival of all humans and organisms. Such a dangerous situation forces humans to choose between doing what they freely wish to do (risking pain, suffering, and death in the process) or setting limits on their behavior. The demonstrable effects of pollutants on people appears to force the formation of laws and enlightened moral attitudes that discourage the practice of releasing dangerous chemicals into the atmosphere. These kinds of laws cannot be said to have emerged from some abstract philosophical theory of right and wrong. Instead, they appear to have evolved from real life situations in which human beings are forced to adapt to threatening circumstances in order to maintain their health and quality of life. Morality is sometimes viewed in a negative context because it is associated with self-serving political and religious causes. In spite of this fact, the imposition of rules in the main does not lower the quality of human life. To the contrary, carefully laid out rules have the greater potential to improve its quality. Broadly imposing guidelines through the promotion of statutory laws as well as moral, manner, and customary rule systems, redirects social priorities in an efficient way. In turn, there is an increase in societal organization and efficiency that enhances cultural peace, prosperity, and productivity. Social evolution in this light acts as an extension of the same biological processes observed in lower organisms where it appears that tight hierarchical organization and efficient survival strategies further the life of many types of organisms. In theory, nature provides human beings with the means to motivate themselves and create great things by giving them passion and sensitivity. At the same time, it appears to endow them with an extraordinary intelligence to limit the excesses of their emotions. Unfortunately, while people strive to be rational, their actions are still governed by strong emotions. When they respond to emotions that are a derivative of physiology, behavioral excesses inspiring a host of problems manifest themselves. When emotions run high, there needs to be some mechanism present to keep passions from getting out of hand and causing harm to people or the societies they have spent so many years building. In much the same way that circuit breakers in a house prevent an overloaded circuit from melting the wires and causing a fire, moral restraints naturally arise and intervene as reasons (or a reason) to break up the vicious circles of conflict that passions can produce. The emergence of moral laws and sentiments, shaping the course of history, is therefore an extension of human physiology that stabilizes relationships so that people grow and prosper instead of conflicting to the point of extinction. The reader may wish to consider skipping the preface for now. An introduction was written to clarify a broad range of topics in a short space, duplicating some of the preface. This book develops the idea that there is a rational basis for the existence of ethics. Such an approach is daunting because the idea of reason or rational causes at work in the formation of ethics has been seriously challenged since the eighteenth century Enlightenment. However, there have been developments in biology and cybernetics that lead to a comprehensive theory of morality in which the rational nature of ethics can more easily be explained. Not only can the rise of ethical systems be linked to biological concepts, but ethics can be tied to mathematical concepts as well by way of cybernetic science. When ethics and cybernetics are combined, the resulting theory turns on scientific principles instead of philosophical speculations. There are several important ideas linked to the emergence of ethical systems: first, that ethical systems evolve in response to the human need to survive in an environment where they are competing with many other organisms for scarce resources; second, that humans survive and flourish by efficiently using their resources and energies; and third, that the evolution of ethical systems is a function of an ongoing cybernetic process involving all humans, animals, and organisms. Human experiences accumulate as a reservoir of knowledge, which influences the societal perception of which behaviors benefit people and which act counterproductive to their health and welfare. When people deviate from behaviors that are known to be productive, feedback arises that affects their lives in both subtle and obvious ways. Thus, the way in which people write laws and attach moral significance to certain behaviors is linked to a cybernetic process that maximizes human survival, minimizes social conflicts, and increases the meaningfulness of the human experience. Feedback that inspires change enhances the human ability to survive and to compete with other animals and organisms. This is important in the sense that some biologists believe that ninety-nine percent of all species that have ever existed are now extinct. In order to build a bridge between the biological world of organic struggles for survival and the moral world of right and wrong, a simplified explanation of the evolutionary process is presented. This is necessary to illustrate how survival inspires a cybernetic process leading to the rise of ethical systems. The resulting theory sounds similar to some of the ideas of Thomas Hobbes. Where the two systems differ greatly is that the evolution of ethical systems here is viewed as an extension of a biological process, grounded in cybernetic principles, whereas Hobbes ian philosophy derives from traditional ethical thinking touching on linguistic and meta-ethical aspects of reasoning. What is important to note is how conflicts and potential conflicts act as a form of cybernetic feedback to society that alerts people to make changes in the way they behave. Feedback is an essential ingredient in evolutionary growth. Traffic laws vividly illustrate how the forces of human survival and the need for the synchronization of many parts work. While the ideas of individual philosophers are not discussed directly, their relevance is implicit in the writing. Biological perspectives likewise do not address biological theory directly on a technical level. Books such as Living Systems, by James Grier Miller; The Selfish Gene, by Richard Dawkins; and Mankind Evolving, by Theodosius Dobzhansky are more appropriate sources, in a field of many good books, for understanding biological phenomena. These three books illuminate the complexity of biological systems in a way that ultimately leads to ethical questions. For instance, the idea of incorporating the notion of organization and efficiency in ethical theory has its analog in Miller's living systems theory. Here it seems evident that successful organic strategies for survival have created extremely complex and efficient hierarchies of order in nature. The principles governing the evolution and survival of lower organisms seem much the same as the forces driving the development of moral systems. Living systems theory invites the question that if organic systems are so incredibly diverse and complex, why would the nature of moral systems be any different, suggesting that philosophical conundrums of the past regarding the nature of morality stem from underestimating the complexity of moral science. In Richard Dawkins' writings there are illustrations of how pervasive the struggle for survival is. Such struggle involves not only humans but lower organisms, all competing with each other for scarce resources. Dawkins' ideas are important in realizing that humans, after all, still act involuntarily on a biological level. Like it or not, struggles manifest in elegant and concealed forms have endured and proliferated to this day in human societies. Both Miller's and Dawkins' writings lend visual texture to the sense of complex systems uniting in cooperative strategies to further their mutual survival. The rise of ethical systems in this sense is a cooperative effort of humanity that has the effect of optimizing its energies and resources in an ever increasing dynamic of survival guided by cybernetic principles. Dobzhansky's work is crucial to understanding how human beings adapt to a hostile environment by changing the way their cultures are structured. The idea that human culture is an instrument of biological adaptation is central to perceiving how Dobzhansky, and those who followed him, were perhaps unknowingly the first to establish credible bridge points linking ethics with biology. Based on a work at evolutionaryethics.com.